Crystal Cubism is a distilled form of Cubism consistent with a shift, between 1915 and 1916, towards a strong emphasis on flat surface activity and large overlapping geometric planes. The primacy of the underlying geometric structure, rooted in the abstract, controls practically all of the elements of the artwork. 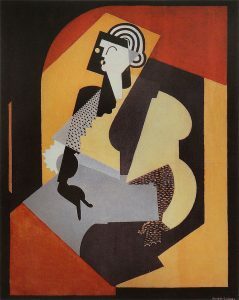 This range of styles of painting and sculpture, especially significant between 1917 and 1920 (also referred to as the Crystal Period, classical Cubism, pure Cubism, advanced Cubism, late Cubism, synthetic Cubism, or the second phase of Cubism), was practiced in varying degrees by a multitude of artists; particularly those under contract with the art dealer and collector Léonce Rosenberg-Henri Laurens, Jean Metzinger, Juan Gris and Jacques Lipchitz most noticeably of all. The tightening of the compositions, the clarity and sense of order reflected in these works, led to its being referred to by the French poet and art critic Maurice Raynal as ‘crystal’ Cubism. Considerations manifested by Cubists prior to the outset of World War I, such as the fourth dimension, dynamism of modern life, the occult, and Henri Bergson’s concept of duration—had now been vacated, replaced by a purely formal frame of reference that proceeded from a cohesive stance toward art and life. As post-war reconstruction began, so too did a series of exhibitions at Léonce Rosenberg’s Galerie de L’Effort Moderne: order and the allegiance to the aesthetically pure remained the prevailing tendency. The collective phenomenon of Cubism once again—now in its advanced revisionist form—became part of a widely discussed development in French culture. Crystal Cubism was the culmination of a continuous narrowing of scope in the name of a return to order; based upon the observation of the artists relation to nature, rather than on the nature of reality itself. Crystal Cubism, and its associative rappel à l’ordre, has been linked with an inclination—by those who served the armed forces and by those who remained in the civilian sector—to escape the realities of the Great War, both during and directly following the conflict. The purifying of Cubism from 1914 through the mid-1920s, with its cohesive unity and voluntary constraints, has been linked to a much broader ideological transformation towards conservatism in both French society and French culture. In terms of the separation of culture and life, the Crystal Cubist period emerges as the most important in the history of Modernism. Cubism, from its inception, stems from the dissatisfaction with the idea of form that had been in practiced since the Renaissance. Cézanne was preoccupied by the means of rendering volume and space, surface variations (or modulations) with overlapped shifting planes. Increasingly in his later works, Cézanne achieves a greater freedom. His work became bolder, more arbitrary, more dynamic and increasingly nonrepresentational. As his color planes acquired greater formal independence, defined objects and structures began to lose their identity. Artists at the forefront of the Parisian art scene at the outset of the 20th century would not fail to notice the tendencies toward abstraction inherent in the work of Cézanne, and ventured still further. A reevaluation in their own work in relation to that of Cézanne had begun following a series of retrospective exhibitions of Cézanne’s paintings held at the Salon d’Automne of 1904, the Salon d’Automne of 1905 and 1906, followed by two commemorative retrospectives after his death in 1907. By 1907, representational form gave way to a new complexity; subject matter progressively became dominated by a network of interconnected geometric planes, the distinction between foreground and background no longer sharply delineated, and the depth of field limited. From the 1911 Salon des Indépendants, an exhibition which officially introduced “Cubism” to the public as an organized group movement, and extending through 1913, the fine arts had evolved well beyond the teachings of Cézanne. Where before, the foundational pillars of academicism had been shaken, now they had been toppled. 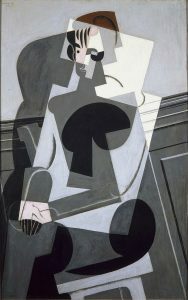 “It was a total regeneration”, writes Gleizes, “indicating the emergence of a wholly new cast of mind. Every season it appeared renewed, growing like a living body. Its enemies could, eventually, have forgiven it if only it had passed away, like a fashion; but they became even more violent when they realized that it was destined to live a life that would be longer than that of those painters who had been the first to assume the responsibility for it”. The evolution towards rectilinearity and simplified forms continued through 1909 with greater emphasis on clear geometric principles; visible in the works of Pablo Picasso, Georges Braque, Jean Metzinger, Albert Gleizes, Henri Le Fauconnier and Robert Delaunay. 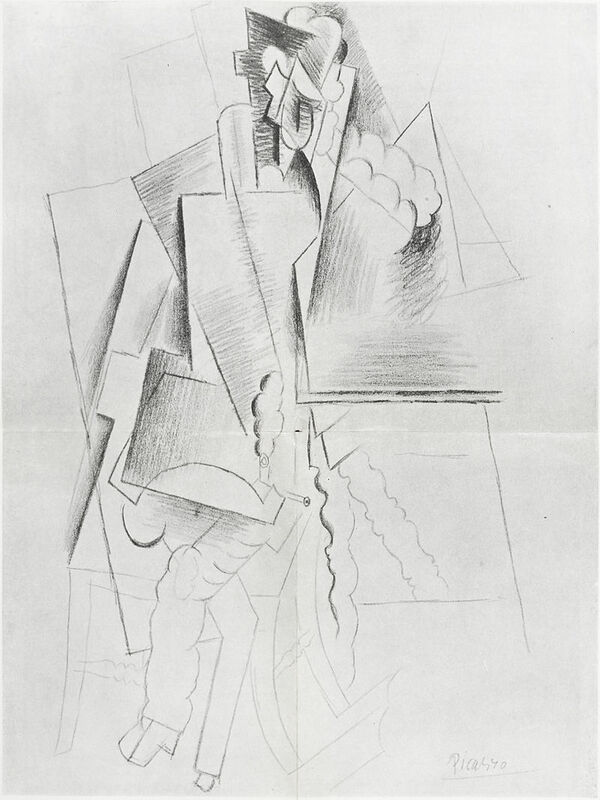 The Cubist method leading to 1912 has been considered ‘analytical’, entailing the decomposition of the subject matter (the study of things), while subsequently ‘synthetic’, built on geometric construction (free of such primary study). 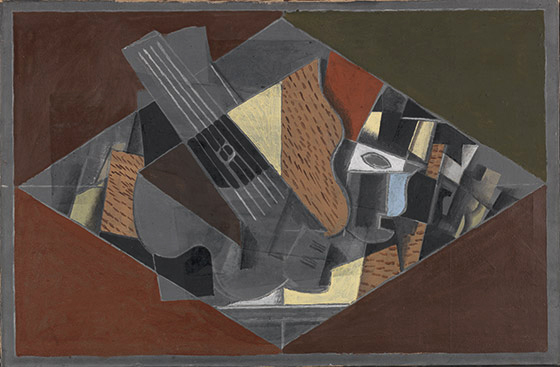 The terms Analytic Cubism and Synthetic Cubism originated through this distinction. By 1913 Cubism had transformed itself considerably in the range of spatial effects. At the 1913 Salon des Indépendants Jean Metzinger exhibited his monumental L’Oiseau bleu; Robert Delaunay L’équipe du Cardiff F.C. ; Fernand Léger Le modèle nu dans l’atelier; Juan Gris L’Homme au Café; and Albert Gleizes Les Joueurs de football. At the 1913 Salon d’Automne, a salon in which the predominating tendency was Cubism, Metzinger exhibited En Canot; Gleizes Les Bâteaux de Pêche; and Roger de La Fresnaye La Conquête de l’Air. In these works, more so than before, can be seen the importance of the geometric plane in the overall composition. Historically, the first phase of Cubism is identified as much by the inventions of Picasso and Braque (amongst the so-called Gallery Cubists) as it is with the common interests towards geometrical structure of Metzinger, Gleizes, Delaunay and Le Fauconnier (the Salon Cubists). 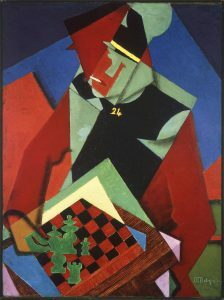 As Cubism would evolve pictorially, so too would the crystallization of its theoretical framework advance beyond the guidelines set out in the Cubist manifesto Du “Cubisme”, written by Albert Gleizes and Jean Metzinger in 1912; though Du “Cubisme” would remain the clearest and most intelligible definition of Cubism. At the outset of the First World War many artists were mobilized: Metzinger, Gleizes, Braque, Léger, de La Fresnaye, and Duchamp-Villon. Despite the brutal interruption, each found the time to continue making art, sustaining differing types of Cubism. Yet they discovered a ubiquitous link between the Cubist syntax (beyond pre-war attitudes) and that of the anonymity and novelty of mechanized warfare. Cubism evolved as much a result of an evasion of the inconceivable atrocities of war as of nationalistic pressures. Along with the evasion came the need to diverge further and further away from the depiction of things. As the rift between art and life grew, so too came the burgeoning need for a process of distillation. This period of profound reflection contributed to the constitution of a new mindset; a prerequisite for fundamental change. The flat surface became the starting point for a revaluation of the fundamental principles of painting. Rather than relying on the purely intellectual, the focus now was on the immediate experience of the senses, based on the idea according to Gleizes, that form, ‘changing the directions of its movement, will change its dimensions’ [“La forme, modifiant ses directions, modifiait ses dimensions”], while revealing the “basic elements” of painting, the “true, solid rules – rules which could be generally applied”. It was Metzinger and Gris who, again according to Gleizes, “did more than anyone else to fix the basic elements… the first principles of the order that was being born”. “But Metzinger, clear-headed as a physicist, had already discovered those rudiments of construction without which nothing can be done.”Ultimately, it was Gleizes who would take the synthetic factor furthest of all. 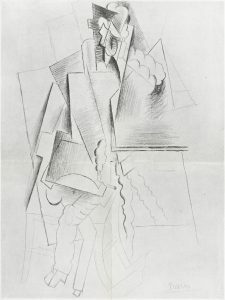 The divers Cubist considerations manifested prior to World War I, such as the fourth dimension, dynamism of modern life, and Henri Bergson’s concept of duration—had now been replaced by a formal reference frame which constituted the second phase of Cubism, based upon an elementary set of principles that formed a cohesive Cubist aesthetic. This clarity and sense of order spread to almost all of the artists exhibiting at Léonce Rosenberg’s gallery—including Jean Metzinger, Juan Gris, Jacques Lipchitz, Henry Laurens, Auguste Herbin, Joseph Csaky, Gino Severini and Pablo Picasso—leading to the descriptive term ‘Crystal Cubism’, coined by Maurice Raynal, an early promoter of Cubism and continuous supporter during the war and post-war phase that followed. 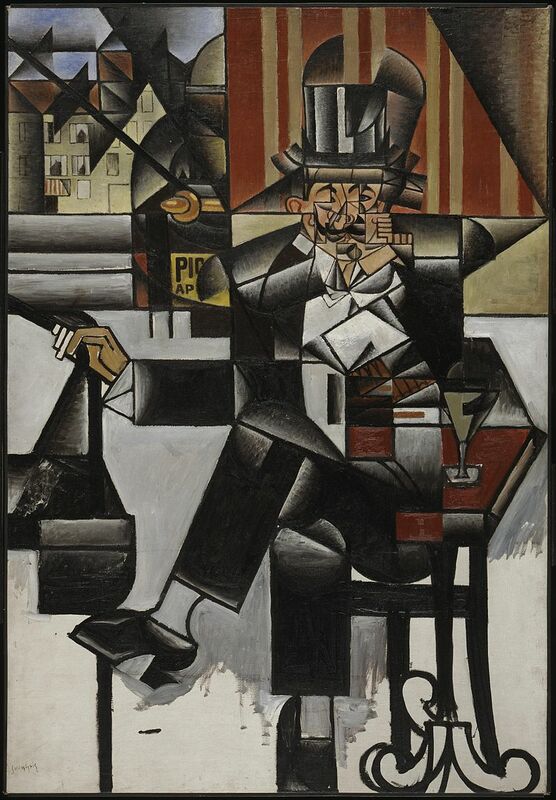 Raynal had been associated with Cubists since 1910 via the milieu of Le Bateau-Lavoir. 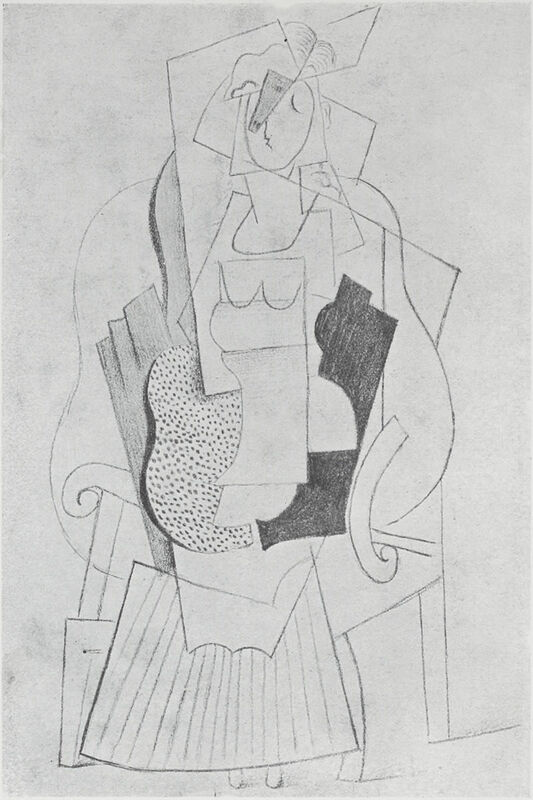 Raynal, who would become one of the Cubists most authoritative and articulate proponents, endorsed a wide range of Cubist activity and for those who produced it, but his highest esteem was directed toward two artists: Jean Metzinger, whose artistry Raynal equated with Renoir and who was ‘perhaps the man who, in our epoch, knows best how to paint’. 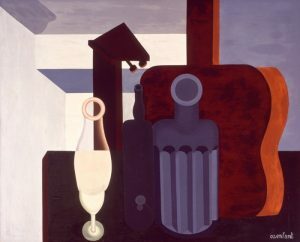 The other was Juan Gris, who was ‘certainly the fiercest of the purists in the group’. In 1915, while serving on the front line, Raynal suffered a minor shrapnel wound to the knee from exploding enemy artillery fire, though the injury did not necessitate his evacuation. Upon returning from the front line, Raynal served briefly as director for publications of Rosenberg’s l’Effort moderne. For Raynal, research into art was based on an eternal truth, rather than on the ideal, on reality, or on certitude. Certitude was nothing more than based on a relative belief, while truth was in agreement with fact. The only belief was in the veracity of philosophical and scientific truths. “Direct reference to observed reality” is present, but the emphasis is placed on the “self-sufficiency” of the artwork as objects unto themselves. The priority on “orderly qualities” and the “autonomous purity” of compositions are a prime concern, writes art historian Christopher Green. Crystal Cubism also coincided with the emergence of a methodical framework of theoretical essays on the topic, by Albert Gleizes, Juan Gris, Fernand Léger, Gino Severini, Pierre Reverdy, Daniel-Henry Kahnweiler, and Maurice Raynal. The following month, Vauxcelles forecast the final demise of Cubism by the fall of 1918. With the fall came the end of the war, and in December, a series of exhibitions at Galerie l’Effort Moderne of Cubist works demonstrated that Cubism was still alive. 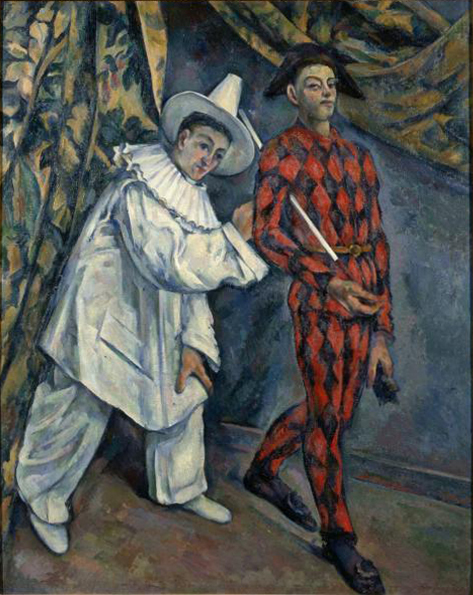 Defections by Diego Rivera and André Favory (fr) from the Cubist circle, cited by Pinturrichio, proved to be insufficient grounds upon which to base his prediction. Vauxcelles even went as far as organizing a small exhibition at the galerie Blot (late 1918) of artists that appeared to be anti-Cubist; Lhote, Rivera and Favory among them. Allies in Vauxcelles ongoing battle against Cubism included Jean-Gabriel Lemoine (L’Intransigeant), Roland Chavenon (L’Information), Gustave Kahn (L’Heure), and Waldemar George (Jerzy Waldemar Jarocinski (fr)), who would soon become one of the leading post-war supporters of Cubism. Inversely, once a steadfast supporter of Cubism, André Salmon in 1917-18 predicted too its demise; claiming it to have been merely a phase leading to a new art-form more closely attuned with nature. Two more former advocates of Cubism had also defected, Roger Allard (fr) and Blaise Cendrars, joining the ranks of Vauxcelles in frontline attacks on Cubism. Allard reproached the visible distancing of Cubism from the dynamism and diversity of lived experience toward a universe of purified objects. Similarly, Cendrars wrote in an article published May 1919 “The formulae of the Cubists’ are becoming too narrow, and can no longer embrace the personality of the painters”. Another vigorous supporter of Cubism was the art dealer and collector Léonce Rosenberg. By the end of 1918—filling in the vacuum left in the wake of D.-H. Kahnweiler’s imposed exile—Rosenberg purchased works by almost all of the Cubists. 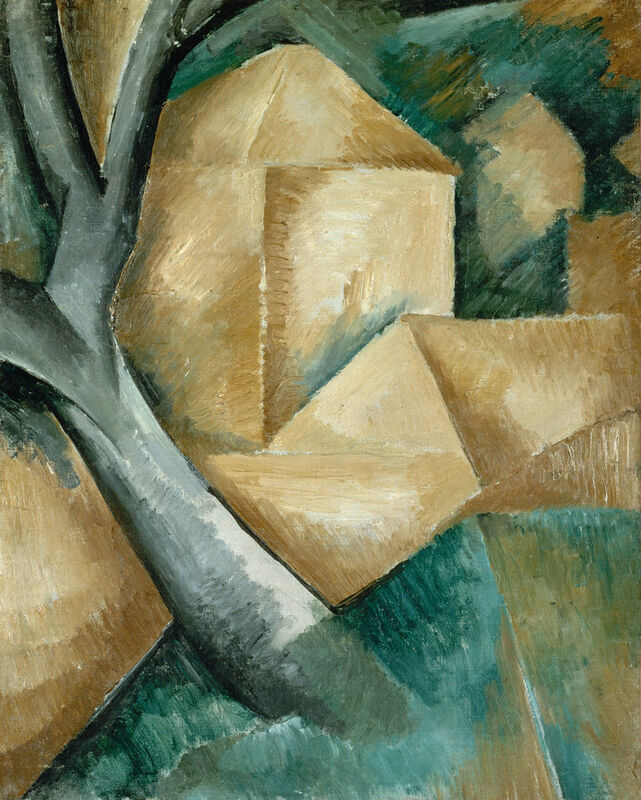 His defense of Cubism would prove to be longer-lasting and wider-ranging than Reverdy’s. His first tactical maneuver was to address a letter to Le Carnet de la Semaine denying the chimerical claim made by Vauxcelles that both Picasso and Gris had defected. Much more poignant and difficult to combat, however, was his second tactical maneuver: a succession of prominent Cubist exhibitions held at the Galerie de L’Effort Moderne, in Rosenber’s Hôtel particulier, 19, rue de la Baume, located in the elegant and stylishly fashionable 8th arrondissement of Paris. 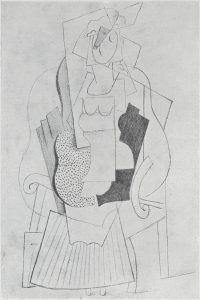 This series of large exhibitions—including works created between 1914 and 1918 by almost all the major Cubists—began 18 December with Cubist sculptures by Henri Laurens, followed in January 1919 with an exhibition of Cubist paintings by Jean Metzinger, Fernand Léger in February, Georges Braque in March, Juan Gris April, Gino Severini May, and Pablo Picasso in June, marking the climax of the campaign. This well-orchestrated program showed that Cubism was still very much alive, and it would remain so for at least a half-decade. Missing from this sequence of exhibitions were Jacques Lipchitz (who would exhibit in 1920), and those who had left France during the Great War: Robert Delaunay and Albert Gleizes most obviously. Nonetheless, according to Christopher Green, “this was an astonishingly complete demonstration that Cubism had not only continued between 1914 and 1917, having survived the war, but was still developing in 1918 and 1919 in its “new collective form” marked by “intellectual rigor”. In the face of such a display of vigor, it really was difficult to maintain convincingly that Cubism was even close to extinction”. The War over, everything organizes, everything is clarified and purified; factories rise, already nothing remains as it was before the War: the great Competition has tested everything and everyone, it has gotten rid of the aging methods and imposed in their place others that the struggle has proven their betters… toward rigor, toward precision, toward the best utilization of forces and materials, with the least waste, in sum a tendency toward purity. Ozenfant and Jeanneret felt that Cubism had become too decorative, practiced by so many individuals that it lacked unity, it had become too fashionable. Their clarity of subject matter (more figurative, less abstract than the Cubists) had been welcomed by members of the anti-Cubist camp. They showed works that were a direct result of observation; perspectival space only slightly distorted. Ozenfant and Jeanneret, like Lhote, remained faithful to the Cubist idiom that form should not be abandoned. Some of the works exhibited related directly to the Cubism practiced during the war (such as Ozenfant’s Bottle, Pipe and Books, 1918), with flatted planar structures and varying degrees of multiple perspective. For Ozenfant and Jeanneret only Crystal Cubism had conserved the geometric rigor of the early Cubist revolution. In 1915, in collaboration with Max Jacob and Guillaume Apollinaire, Ozenfant founded the magazine L’Élan, which he edited until late 1916. In 1917 he met Jeanneret, with whom he would join forces between 1918 and 1925 on a venture called Purism: a variation of Cubism in both painting and architecture. In collaboration with the pro-Cubist writer, poet, and critique Paul Dermée, Ozenfant and Jeanneret founded the avant-garde journal L’Esprit Nouveau, published from 1920 to 1925. In the last issue, Jeanneret, under the pseudonym Paul Boulard, writes of how the laws of nature were manifested in the shape of crystals; the properties of which were hermetically coherent, both interiorly and exteriorly. In La peinture moderne, under the title Vers le crystal, Ozenfant and Jeanneret liken the properties of crystals with the true Cubist, whose œuvre tends toward the crystal. A second Purist exhibition was held at the Galerie Druet, Paris, in 1921. In 1924 Ozenfant opened a free studio in Paris with Fernand Léger, where he taught with Aleksandra Ekster and Marie Laurencin. 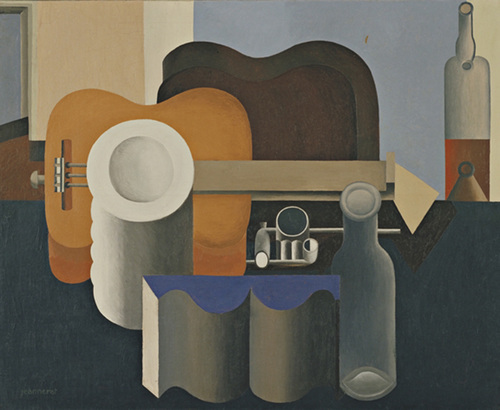 Ozenfant and Le Corbusier wrote La Peinture moderne in 1925. In final issue of L’élan, published December 1916, Ozenfant writes: “Le Cubisme est un movement de purism (Cubism is a movement of purism). We see the real cubists continue their work, imperturbable; they are also seen to continue their influence on spirits… They will arrive more or less strongly depending on the oscillations of their nature, their tenacity or their concessions and analysis [tâtonnement] that are characteristic of artistic creation, to search for a state of clarification, condensation, firmness, intensity, synthesis; they will arrive at a true virtuosity of the game of shapes and colors, as well as a highly developed science of the composition. Overall and despite the personal coefficients, one can discern a tendency towards what might be imaged in saying: tendency toward the crystal. The Crystal Cubists embraced the stability of everyday life, the enduring and the pure, but too the classical, with all that it signified respecting art and ideal. Order and clarity, right to the core of its Latin roots, was a dominant factor within the circle of Rosenberg’s L’Effort moderne. While Lhote, Rivera, Ozenfant and Le Corbusier attempted to attain a compromise between the abstract and nature in their search for another Cubism, all of the Cubists shared common goals. The first, writes Green: “that art should not be concerned with the description of nature… The rejection of Naturalism was intimately bound up with the second basic principle shared by them all: that the work of art, being not an interpretation of anything else, was something in its own right with its own laws”. These same sentiments observable from the outset of Cubism were now essential and prevailing to an extent never before seen. There was a third principle that followed from the former that came to light during the Crystal period, again according to Green: “the principle that nature should be approached as no more than the supplier of ‘elements’ to be pictorially or sculpturally developed and then freely manipulated according to the laws of the medium alone”.